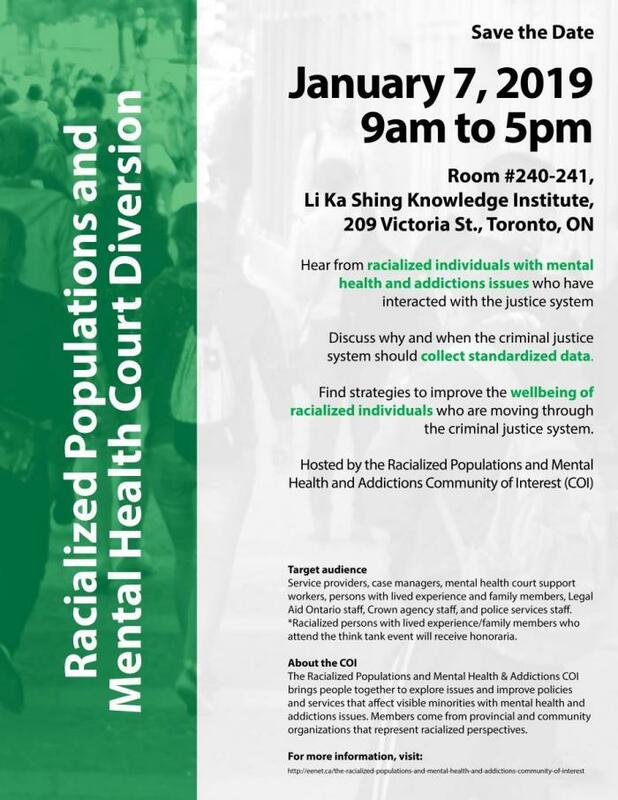 Join the Racialized Populations and Mental Health & Addictions COI as they get together to discuss the challenges and implications of being a racialized person going through the justice system. What are some strategies to improve the wellbeing of racialized individuals who are moving through the justice system? Is it important that the criminal justice system collect standardized data? Why? Time/Date: January 7, 2019 at 10:00 a.m. - 4:00 p.m.
Service providers, case managers, mental health court support workers, persons with lived experience and family members, Legal Aid Ontario staff, Crown agency staff, and police services staff. *Racialized persons with lived experience/family members who attend the think tank event are eligible to receive honoraria. The Racialized Populations and Mental Health & Addictions COI brings people together to explore issues and improve policies and services that affect visible minorities with mental health and addictions issues. Members come from provincial and community organizations that represent racialized perspectives. Click here for pdf version of poster.